Discover campsites of South West France but also over 450 campsites throughout France, offering a variety of rental mobile homes, chalets and accommodation of more atypical as bungalows or caravans, but also leisure facilities such as aquatic areas with sometimes an indoor or well even with heated pool for your comfort, for an unforgettable vacation. 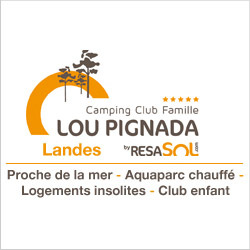 Campsites in South West de France welcome you to your camping holiday 2, 3, 4 and 5 star or LRP. 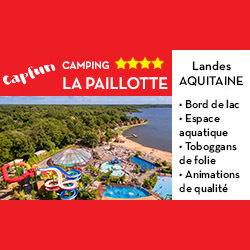 Campsites with recreational facilities (swimming pool, water park, water park, water slides, wading pool, spa, playground, tennis court, multi-sports), entertainment and services (restaurant, bar, food, WiFi access, disabled access, camper services) to make the best of holidays throughout South West de France. 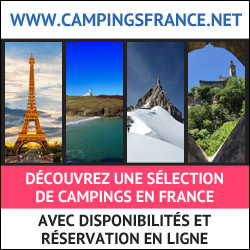 Traditional camping in South West de France on pitches or rental of mobile home camping, campsites below offer the best camping in South West de France. 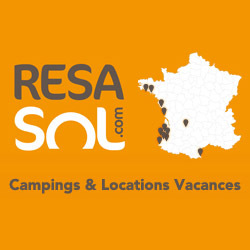 Enjoy the outdoor accommodation and campsites in South West de France! Rental of mobile homes, chalets, bungalows, cottages, Bengali, cottages, trailers, caravans, tipis and camping sites equipped for your holidays in South West de France, our French campgrounds welcome you everywhere in South West de France, a favorite camping in Europe. 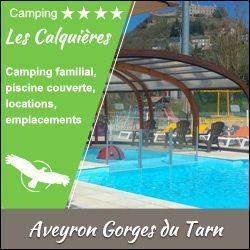 Have a great holiday camping with our campsites in South West de France! 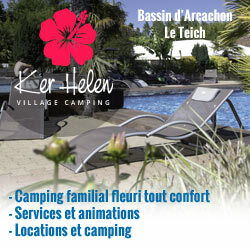 Camping L'Eau Vive at the heart of a region full of nature and historical sites to visit, is situated in Carennac. Listed as one of the most beautiful villages of France, near the Gouffre de Padirac with his underground river and a famous pilgrim town: Rocamadour. From caves to mediaval towns, from fortified towns to castles. The Lot offers you various possibilities to go out. OUR ASSETS : - Friendly, family atmosphere - Ideal starting point for hikes in Quercy-Perigord - Direct access to the Dordogne river - Kayak hire on site -WIFI - A touristic spot. 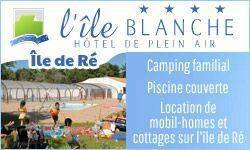 Our Camping in Gironde, Aquitaine, France, the Camping Les Peupliers is a 3 stars camping, offering various pitches, Mobil-homes and caravans rentals. The camping offers numerous free services. The camping is equipped with a swimming pool, a Snack, a grocery and a playground. The camping proposes rentals of Mobil homes and caravans for your holiday’s rental, pitches for traditional stay in Tents, caravans or camping car but also pitches rental year-round for Mobil-home and caravans. Located minutes downtown Vendays-Montalivet, you will find all commodities on foot. Your holidays! Camping sponsor Show Bike Aquitaine. 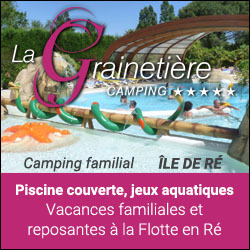 Small Camping calm and family oriented in Gironde. The Medoc, an area to discover by camping. .
Découvrez les douceurs de l'Ile de Ré au camping 3 étoiles "Le Suroit". Situé au sud de l'Ile de Ré en Charente Maritime, il vous ouvre ses portes pour des vacances reposantes entre terre et mer. 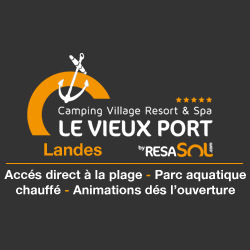 Welcome to the island of Ré, at Camping Municipal LES REMPARTS** in Saint-Martin-de-Ré in Charente-Maritime. The campsite has 115 delimited pitches and 20 mobile homes for rent. Discover the charm of the citadel with the fortifications of Vauban (listed as a UNESCO World Heritage Site), local shops and entertainment in season. The campsite is located within the city walls, close to the beach and cycle paths, and is open from mid-February to mid-November. 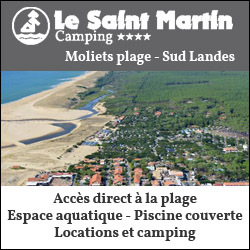 Book online from www.camping-saintmartindere.com or by phone: 05 46 09 21 96. See you soon on Camping on the island of Ré. Family campsite situated between Dax and the Atlantic beaches. The camping is only 500m from the villages which has numerous shops including 3 restaurants and a supermarket. The camping has 2 heated pools with and a paddling pool and 3 water slides, a multi sports ground (Basketball, football, volleyball, Tennis), a bar with games room (Pool table,table football, air hockey)There is organised entertainment during the summer, ping-pong tables, WIFI connection all over the site, Automatic laundry. Credit cards accepted. Find The Campsite Spirit With Aloa Vacances! Choose among 17 destinations, from the coast of the Atlantic to the Mediterranean coast, through the Dordogne. We offer you multiple choice of fully equipped accommodation and all with a terrace. Our quality campsites welcomes you for exotic family or friends holidays. Do not hesitate and book now for an unforgettable stay. Our riverside site is situated in Montpon-Ménesterol in the ‘Perigord Blanc’ area of the Dordogne. A warm family welcome to our peaceful and relaxing site, in its green environment, will help to make your holiday a success. Note: English spoken. La Cigaline has 110 pitches spread over 7 acres, to accommodate your motorhome, caravan or camping requirements, with a choice of open, part or fully-shaded pitches. Alternatively, as shown, you can hire one of our mobile homes or caravans. La Cigaline also has a snack bar where reasonably priced meals and drinks can be ordered for residents and visitors. The decking overlooking the river is an ideal spot to enjoy eating outside during your stay in the area. Free WiFi is available in the general area of the bar and on certain pitches. Longing for rest, walks, change of scene, beach, woods, fishing, and chilling while listening to music at night? 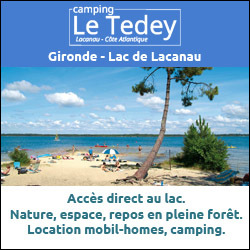 "Les Vignes" campground waits for you for nice solo, romantic or family holidays by only a 6 minutes ride through the woods from "La Grande Cote", one of the most beautiful watched beaches in the area. 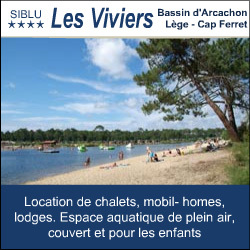 Come to see our sites, trailers and mobile-homes close to Royan/La Palmyre and to revitalize yourself with some fresh air and a pretty complex meticulously drawn to give joy to children and grown-ups. Heated water park watched over in July and August, multipurpose sports field (300 m2), giant trampoline, bounce house, playgrounds, petanque, table tennis, gaming room/pool, wifi. Snack-bar-restaurant with 3 free weekly evening shows in July and August: dance music, live music, and karaoke. 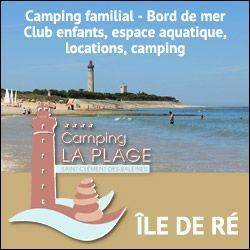 Situated 100 metres from the La Conche beach, (the finest beach on the island of Ré) and 500 metres from the Baleines lighthouse, the LA PLAGE campsite offers a wide choice of accommodations (tent, shack, mobiles-homes 2 or 3 bedrooms) fully equiped for between 4 and 8 people, and large camping pitches. Free Wi-fi system. Non-smoking rentals. Want o relax ? enjoy our Zen Area with saunas ! News 2015 : find out our Coco Sweet tents and our new mobile-home O'hara L-shaped loundge. 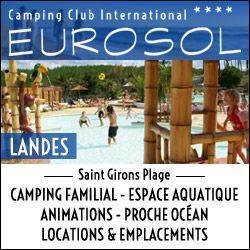 Welcome to Vielle Saint Girons at Camping L'Océane 4 stars! Located in Les Landes in Aquitaine, just 7 km from the sandy beaches between Mimizan and Hossegor. With all the comforts and facilities of a large and 99 pitches, this campsite has been characterized for two generations by a family campsite on a human scale that offers a welcoming place in the countryside where intimacy and conviviality replace the anonymity of crowds gigantic campsites. We have everything planned to guarantee you a great holiday at the campsite Océane !! : Heated pools with water slides for young and old, mini kids club, snack bar with 3 musical evenings, grocery drive, inflatable games, children's playground Stadium City, petanque, laundry, etc. Without forgetting our team of animators who will offer you during the day a complete program to make your holidays unforgettable .. we offer a wide range of mobile homes from 4 to 7 people fully equipped with covered terrace and garden furniture or traditional sites for your stay in tent, caravan or camper. Come and share authentic and unforgettable moments ... At the ocean we are good, At the ocean we come back! 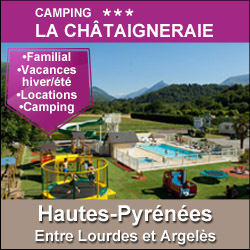 We welcome you to Camping La Chesnays, 4 stars, in a friendly and family atmosphere in a wooded and bucolic. The campsite is located in Montalivet in the heart of the Medoc and near the seaside in Gironde (33) - New Aquitaine. You can enjoy the long sandy beaches of the Atlantic and many water activities, then discover the Gironde Estuary and the Médocain vineyards. Our campsite has an outdoor heated pool open from May, wifi on all sites (fee) and hot spot wifi bar, catering service, brunch and coffee in season. For your holidays or week-end by the sea, we offer the rental of mobile homes, chalets, accommodation "Glamping" (unusual and comfortable) such as Coco Sweet and Tent Lodge comfort, as well as spacious camping pitches. 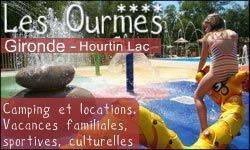 Located just near the lake of Soustons and surrounded by the pines forest, our campsite offers a leisure area composed by a swimming pool, a children pool and a heated outdoor jacuzzi; you can have sport activities into the kids area and multi-sport ground. Enjoy funny evenings thanks to 3 /5 entertainments by week for children and for adults. The lake is the best natural place for water activities such as windsurfing and sailing. The bike lane into the forest is going across Soustons. The best sandy beaches are situated in seaside resorts like Messanges, Vieux-Boucau et Moliets. Discover les Landes through markets, village festival, and gastronomy into a sunny region. Have relaxed holidays and choose between ocean, forest and lakes, on South Atlantic Coast, close by Spain, in a lush vegetation. 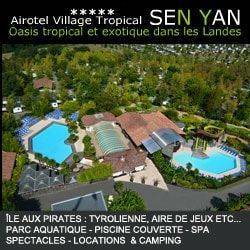 5 km from ROYAN and the beaches of ` La Côte de Beauté`.Countryside atmosphere. Family Barbecues are recommended ! 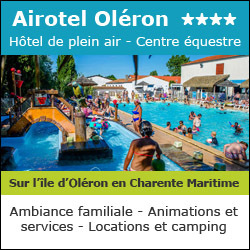 Situated not far from "La Tremblade" on the east side and to the Atlantic Ocean on the ouest side,the La Clairière Camping 4* welcomes you in the heart of the Charente Maritime department. The campsite is not far from the vast "Coubre Forest" and is located in the middle of it. Not far from the coast, the first beaches are at 5 min by car. Discover our aquatic parc: lagoon, swimming pools, slides, waterplay. We wanted our camping to be a family campsite, with calm and shaded pitches. On the banks of the Dordogne; protected site; pretty, confortable and clean. Dream swimmingpool open and heated from 1 mai till 21 sept ! Welcome to the Camping Airotel L’Océan, a 9.5 hectare campsite in a hilly pine forest, just 10 min walk from one of the Atlantic Coast’s most beautiful sandy beaches, and 15 min from the centre of Lacanau Océan, one of Aquitaine’s biggest seaside resorts. We offer a warm welcome in a friendly atmosphere, whether you choose a holiday rental or tent pitch, from 6 April 2018 to 3 November 2019. With family and friends, get together in the Tropics at our aquatic park AQUALIDAY, to enjoy 5000m² of water fun areas, including 1500m² of covered and heated pools. Need to relax or boost your energy? LE SPA has a 450m² area dedicated to your well-being. Lovers of countryside walks will find the departure point for over 150km of cycle paths and a GR8 hiking trail at the entrance to the campsite. A warm welcome, a friendly atmosphere, services, facilities, entertainment…at the Camping Airotel L’Océan, you’ll find everything you need for an unforgettable holiday! Our camp-site welcomes all year round if you go for a Holiday home, from April to mid-october if you come with your tent, camper-van or caravan. 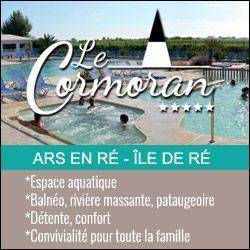 5 km way only from La Rochelle's beautiful Old Harbour, 4 km from the bridge to the Ile de Ré, 400 yards away from shops and services in the village, and half a mile away from the coast... NEW SWIMMING-POOL AREA: swimming-pool outdoors, not covered but still heated !!!! 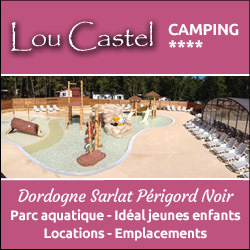 Camping du Lot 3 stars in the Dordogne valley in the heart of Quercy. Loubressac is a medieval village situated on top of the Dordogne valley. You can discover our fabulous secrets of our région by walking (GR 652), trekking, climbing, horse riding, canoeing and fishing. So come and join us at the campsite " la garrigue". 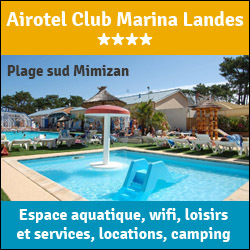 The Marina-Landes Camping Club is located at Mimizan in the Landes Region. Under a 8.8 hectare pine grove 500 metres from the beach, it welcomes you with a green setting and a family-oriented and friendly atmosphere. 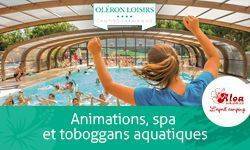 An aquatic centre with 600 m2 of water, one of the biggest in the Landes Region for a campsite of this size: 1 indoor heated 19m pool with spa, a 25m pool, a heated balneotherapy space with spa, massage river, massaging anatomical benches and geysers, 2 recreational paddling pools and 4 water slides. All services are available on-site: restaurant, pizzeria, bar, supermarket, shop, newsagent, multi-sport areas, bicycle rentals, 2 tennis courts, one 750 m2 games area, outdoor fitness equipment, muscle training and fitness room, games room and discotheque. WiFi throughout the site. Full activities during the Easter & Ascension holidays, from 17/6 to 14/9 and one musical evening event every other weekend. Camping pitches and a wide range of rentals: mobile homes, chalets, bungalows and apartments. 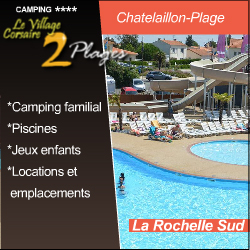 This campground is located in the Gironde and along the Bay of Arcachon is the perfect place for a family holiday. Two direct access to the beach allow you to walk along the coastal path and visit the oyster ports and villages Cassy and Taussat (400 and 900 meters). We offer you free balls, rackets, hockey sticks, board games and various sports equipment to help you avoid unnecessary clutter. We offer many daytime activities such as volleyball tournaments, basketball, football, badminton, bowling, mini golf, water polo, field hockey, baseball, video games, billiards or foosball, initiation Salsa and Zumba classes. From 21h to 00.30h you can enjoy our diverse entertainment, like our foam parties, pop orchestra, circus, magician, puppet shows, bingo, karaoke, but also evenings Carnival, Halloween or Western as well as theme meals. We organize for your pleasure and with our service providers outputs canoe kayak on the Delta of Leyre (nicknamed the Bassin d'Arcachon 'the little Amazon), paintball tournaments and boat rides with the Tourist Office Lanton. You have available on site convenience store, fast or more sophisticated catering to your tastes, a terrace bar, a TV room, a games room, a fitness room, two free internet terminals, wifi , 3 playgrounds for the sake of your children, various sports fields, and an osteopath to give you winter pain. Camping is also equipped with a water park with 3 pools and 2 slides that will delight young and old; our leaders organize two to three times weekly water games and water aerobics. There is also a point of sale of ice cream and cold drinks. For your accommodation we offer several kinds rentals mobile homes, chalets or caravans 2 to 6 people, but above 380 traditional campsites primarily because we want to keep this family friendly spirit that is characteristic of the outdoor accommodation. It is in this framework in the countryside with views over the Bay of Arcachon, Aquitaine pearl, we invite you to spend a pleasant holiday with family or friends and discover our beautiful region. 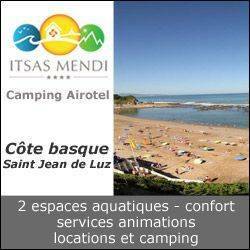 The campsite of IBARRON in the BASQUE COUNTRY is located in a nice village named Saint Pée sur Nivelle, near the beaches of St Jean de Luz, Bidart and Biarritz, near Spain and the Rhune. You can rent mobil-home or pitches for tent, camper or caravan in a beautiful place between ocean and mountain. There is a lot of things to do like hiking, fishing, biking or visits and discovery of Basque culture. The campsite have a heated swimming pool, Wifi, playground for children, stores nearby and a bus stop just front of the campsite. 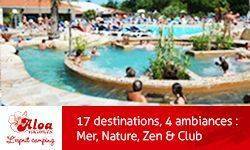 The Moulin de Paulhiac welcomes you in a 4-star campsite to make the most of your holiday in Périgord Noir, ideal starting point to visit the region (Sarlat-la-Canéda, Castle Castelnaud, Domme, Beynac, Belvès, La Roque Gageac , Monpazier ...). 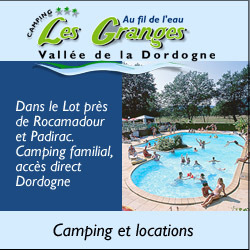 In the heart of a beautiful green valley nestled between the Dordogne and Céou, spacious camping sites for nature lovers and traditional camping, not to mention modern mobile homes or tents comfort. Its former stone water mill in the region and the 6 hectares of the estate offers a comfortable and relaxing atmosphere. You can taste the dishes of the region in our restaurant offering a varied menu. Have a drink at the bar with its large terrace by the pool, come to your grocery shopping or pick up your fresh bread. The whole family will enjoy our large fully heated water park, consisting of an indoor pool, a balneo pool, 3 slides, a paddling pool and a playful aqua area. 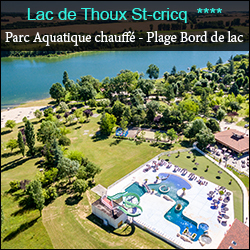 For those who prefer swimming in the river, the campsite has direct access to Céou. In addition to the many activities, our qualified animators offer a children's club until 12 years old every morning in July / August. For athletes, you can enjoy the many hiking and mountain biking directly from the campsite. A stay in one of the most beautiful regions of France steeped in history. Exceptionally located near the Atlantic Ocean and lying against the Pyrenees, this little corner of heaven will enchant you with its many sporting activities, its traditional cooking as well as its numerous celebrations.